The human creativity knows no boundaries and the proof of that is the sea glass jewelry. Do you know those tiny pieces of glass that you can sometimes spot on the seashore? As it turns out, some jewelry makers use those pieces to create jewelry and it looks gorgeous. Of course, not every piece of glass in the sea is jewelry material. It has to have a fascinating story behind it. How can you tell? Well, read further to find out. We promise you will discover the most interesting information about sea glass jewelry in this article. We bet you never thought of the sea as being a master jeweler, but this is exactly what it does when it comes to sea glass. The waves break the glass into small pieces and then wear away their sharp edges. At the same time, the longer glass is in the water, the more frosted it becomes. As the waves break and churn, they leach the chemicals in the glass, covering it with a fine frost layer. After the piece is finished, the waves carry it to the shore where people use it to make sea glass jewelry. It’s a process that takes a very long time, but the final result is absolutely gorgeous. If you were wondering how long, well, at least 20 or 30 years. Of course, you can find sea glass that is more than a hundred years old. Very old sea glass is more valuable, not only because of its history but also because of its color and frost layer. Besides this natural process, there is also the man-made sea glass. Mesmerized by the beauty of the sea glass, people have invented a way to recreate it by themselves. Obviously, natural sea glass is more valuable than the other type. If you have or are planning to buy sea glass jewelry, know that there is always a story behind it. As we mentioned in the beginning, there is a simple way to find out the story of a sea glad jewelry piece – its color. Don’t assume that sea glass comes from bottles that people leave on the shore after a hard beach party. It comes mostly from shipwrecks and natural disasters, which is why every piece of sea glass jewelry has a history. Let’s discover together the rarest types of sea glass and their stories. Not to be confused with brown or dark orange, this type of sea glass is the rarest. This specific color was used only in the 30s for decorative glass creations, which is why the price of an orange sea glass jewelry piece can reach $650. It’s is sometimes hard to tell the difference between turquoise and deep aqua sea glass, but only turquoise is extremely rare. This specific type of sea glass comes from pressed candy dishes, but it is very hard to find a genuine piece. Even though it is not as rare as orange and turquoise, red sea glass is highly coveted. Its unique color makes it ideal for vibrant sea glass jewelry. This type of sea glass comes from vintage tableware and early red warning lights. A deep dark olive color, black sea glass may be the oldest one. In 1700, people used black glass for beer and liquor bottles and some of these bottles ended up in the sea. Of course, black sea glass is very hard to find because, after 1870, people stopped using it. This elegant type of sea glass comes from tableware between 1800 – 1940. Though it is not as rare as the previous types, it is still precious to many collectors and jewelry makers. The darker variety of this sea glass makes wonderful sea glass jewelry. Theoretically speaking, you could find sea glass anywhere there is a sea. But history plays an important role, so the rare varieties of sea glass appear only in a handful of places. The biggest sources of old sea glass are England, Italy, Bermuda, California, Puerto Rico, Spain, and Mexico. 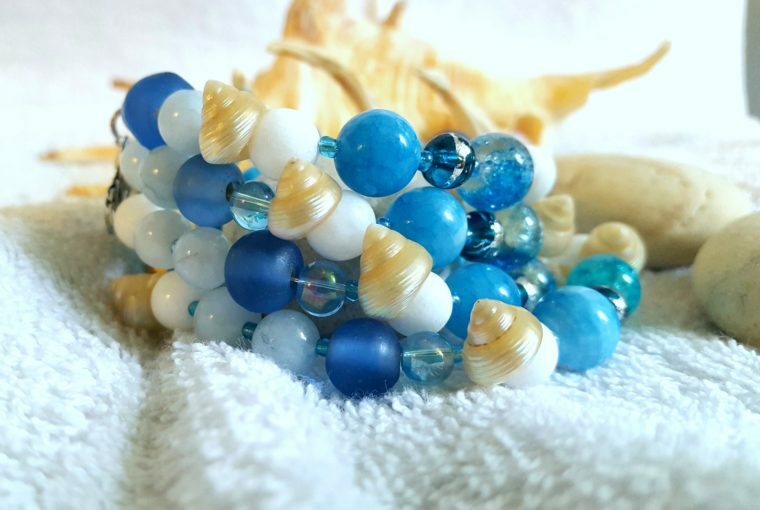 Whether you want to collect sea glass, sell it or make sea glass jewelry out of it, you have to be patient when looking for it. You will mostly discover the most common green and brown varieties, but you could be lucky enough to find cobalt, purple or even pink sea glass. These types of sea glass are not as rare as the ones we discussed, but they are still precious and beautiful. If you want to learn more interesting facts about jewelry, read our other articles as well. To view our unique jewelry collections, visit Ana Luisa online jewelry shop.